“He didn't like being given gifts because it seemed to him, when someone gave him something, that he was under permanent obligation to the giver.” Michelangelo (as described by Vasari in The Lives of the Artists) is under no illusions about the fact that gifts are not free, that they come with a web of strings attached. And yet he is also aware that this is more than a matter of quid pro quo, that there is something strangely incalculable about gifts. They impose a debt out of measure, never simply cleared. They put him under permanent obligation. Why do people get so worked up about gifts? In one of the best insights of his Essay on the Gift, the anthropologist Marcel Mauss wrote that when studying gifts we are dealing, primarily, not with objects but with “terms and notions”—terms and notions that are in the process of being used and defined. Through the giving of gifts human beings put social relations and definitions into play. As the historian Gadi Al Gazi has observed in the recent volume Negotiating the Gift, a gift is almost always dynamically defined in relation to a field of other transaction modes. A token of gratitude should not be confused with protection money. An offering needs to be distinguished from tribute, and a donation from a bribe. A friendly extension is not a loan. An art work is not a piece of merchandise. A lot rides on these distinctions. There may be no such thing as a pure gift, free from all contact with this larger realm of exchanges, but it would be wrong to claim that gifts are nothing more than calculated transactions masking as acts of generosity. Gifts are forms of exchange, but they put the notion of exchange through some major complications. They create deferrals of value that make it impossible simply to factor them into business transactions. They blur exchange rates. They invite a return, but only by detour. We receive a gift and we feel it demands some form of reciprocation, but we don’t know exactly when, in what form, or how much. Sometimes the only response to a gift is to give something to someone else. Gifts go in one direction, even when we are giving back. Human beings do more than eat and procreate; we make meaning out of things. Gifts isolate and exercise that meaning-generating faculty. The ritual of sacrifice—an offering to a supernatural creative / destructive force, a gift intended to keep cosmic rhythms in motion—is an astonishingly consistent feature of human cultures all over the world. Even before the advent of writing, humans engaged in symbolic activity through the practice of gift-giving. All of this suggests that there is a deep link between gift practices and the activity of art-making. This summer’s exhibition results from asking how those two terms, art and gift, are linked—how they interact and define each other. The question was put to a number of artists and non-artists, producing accounts of gifts given and received and a number of reflections on how those gifts relate to artistic practice. Each interview led to the next giver or recipient, who was in turn interviewed, leading to the next, and so on. The sequence of art works and non-art objects that emerged was thus generated by the logic of an ethnographic inquiry rather than by curatorial choice. Curating here took the form of deciding only which direction to go at any one intersection, and at some intersections there was only one option. The gift chain that took shape is not a causal one—it is not chronologically ordered—and it is not unitary. At some intersections there are “branchings” in other directions, indicating that this strand now coursing through the space of apexart is just one among thousands that exist and continue to be generated today. Even this small sampling reveals that the “gift function” is deeply braided into current artistic practice, continually redefining the nature of artistic production and the contexts in which people view and receive works of art. To begin to ask about art and gifts is to raise fundamental questions about the definition of the work of art, and about the historical and economic parameters in which it functions. Those who rail—in the name of art—against the commercial pressures of the art market forget the fact that the art market took systemic form in the seventeenth century as a result of the successful promotion of a “pure,” non-commercial conception of art. In Michelangelo’s time art was typically made on commission: clients signed contracts, disbursed money for materials, and specified a time of delivery. Artists made product. This changed with the rise of the claim that painting and sculpture were “liberal” arts, free and noble pursuits not undertaken as commercial activities. When art started to be made independent of contracts—and, more importantly, when it was given institutional definition as a theoretically “autonomous” cultural activity—the modern art market was born. Art works could no longer be assessed simply according to the old “objective” criteria, such as the quality and amount of materials used. A new, more flexible mechanism had to come into play in order to interpret the newly arbitrary and intangible value of works of art. The art market is not the enemy of the freely created work of art; it is its socio-economic corollary. (And it is also a persistent reminder that the “free” creation of art is a fiction, a fiction that generates art.) It comes as no surprise, then, that the conditions that create an art market continually pull works of art into the sphere of the gift. The intersection of art-making and gift-giving shown here reveals a spectrum of activity that is not often put on public view. Several of the works are indistinguishable from the works by those artists that are shown and sold in art galleries, while some belong to a sub-register of more informal or simply more private production, which sometimes redefines the nature of the more public production. Some of the objects are not art at all, but in this context it is not always easy to tell. How do these different registers relate to one another? 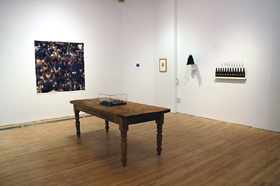 Several of the participants indicated that the arena of gift-giving opened up a sphere of production that they would not consider suitable for display in the gallery, but that they value as part of their practice. Occasionally, however, the gift work translates into the gallery work. The piece by Paul Ramirez Jonas in this show, Observance (Felix), given to Amy Sillman,is now part of a larger body of work. By contrast, the works by Amy Sillman on view here, an illustrated book and a comic-style narrative drawing, are examples of a kind of production that she makes strictly as gifts and that she keeps separate from her gallery paintings. Conversely, the gallery work can assume a different status when given as a gift. The skin painting by Byron Kim in this show belongs to a familiar and much exhibited body of work, but this one is a “portrait” of his first child, given by the artist to his mother-in-law on the child’s first birthday. In this context, it becomes above all a portrait of a grandson for a grandmother. At the same time, this grid of colors is not a typical picture of a grandchild. The recipient of the gift learned a new kind of looking. The art work, redefined as gift, becomes an intersection of two worlds. Gifts sometimes go to the very core of artistic practice. During a period of recovery, Jutta Koether worked for a year and a half on a body of work that she designated as “not-for-exhibition and not-for-sale.” For the first six months she made this work to the exclusion of all other production. Structured drawings made up of arrangements of color on a grid, they were made in an effort to reconstitute her practice from the ground up—and in response to some basic questions. What is art-making? Is it just a myth invented with the modern idea of the artist? “I wanted to go back to the basics,” she said, “and see what was really there.” The only other works she made during that period were occasional gifts for friends, and these were also grid drawings. One, a gift to Richard Phillips, is on view in this show. Several participants in the exhibition have insisted that giving art is a basic part of how they identify themselves as artists. This might seem merely naïve, given the market-driven nature of the art world. Yet the practice continues, threading in and out of that larger economy and prompting basic questions about how it works. It seems appropriate that it come into view at apexart, a not-for-profit exhibition space positioned both inside and outside the system of contemporary art. Alexander Nagel is a writer and art historian who teaches at the University of Toronto.